OAKLAND, CA Daniel Ellsberg told a San Francisco rally of trade unionists that President Obama is lying about the wars in Afghanistan and Iraq. The rally took place Saturday, March 20, inside the Plumbers Hall, 1621 Market Street, prior to a march against the wars in Iraq & Afghanistan held later that day. A well known scholar and peace activist, Ellsberg was the featured speaker at the anti-war labor rally. He rose to fame, and became a hero of the anti-war movement, when he made The Pentagon Papers public in 1971 [ http://en.wikipedia.org/wiki/Daniel_Ellsberg ]. The Pentagon Papers are from a Pentagon study on counter-insurgency in Vietnam which reveal a secret history, and the U.S. government's behind-the-scenes decision making. Ellsberg had used his high level security clearance to copy thousands of pages of the top secret document. 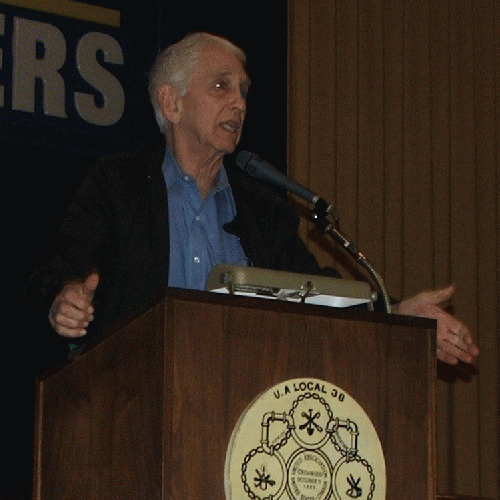 Speaking from a stage draped in a banner that read, "Labor Against the War", Ellsberg began his presentation to the 150 unionists in attendance by linking the wars and military budget to the economy and government budget cutbacks. "None of the problems...society is concerned about can be dealt with as long as we're wasting a vast proportion of our money, and the world's money, on military production and war." A former Pentagon counterinsurgency expert, later employed by the Rand Corporation on counterinsurgency projects in which he continued to work closely with Pentagon analysts, Elllsberg presented his analysis of the current wars. "I think there is no prospect that we will achieve anything of any benefit to anyone in Afghanistan, or to us, by our efforts in Afghanistan," Ellsberg told the audience. "Obama said " he will be withdrawing troops 15 months from now, 18 months from now. Gates [Secretary of Defense] has said maybe 24 months from now, and maybe it won't be too fast... The implicit promise is that that's a ceiling, that we'll be drawing down from that," said Ellsberg. "I don't think there's any chance of that," he declared. Based on his evaluation of the insurgency, Ellsberg predicted that, "there will be more troops in Afghanistan in two years, and still more in four years." Regarding Iraq, Ellsberg said that, "it's taken for granted in everything I read that Obama is going to carry out his promise to get all American troops out of Iraq by the end of 2011 - all combat troops earlier than that, maybe this year. I don't think there's any chance of that."